This is one odd ride. 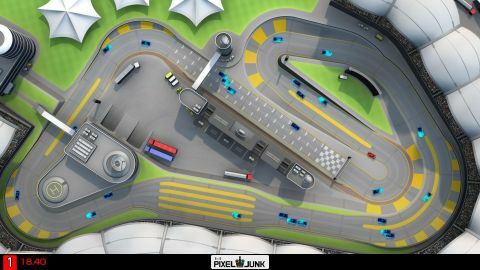 When you first see PixelJunk Racers, its top-down view might remind you of old arcade racing games like Championship Sprint, Super Off Road, or even Death Race. (Want these games? Clickhere! )But it's actually based upon even older source material: those toy slot car race tracks so many of us used to thrash when we were kids. But then you notice that the 10 or so tracks here each have five lanes and as many as 70-80 cars on them at a given time, and realize that this is clearly a new generation of slot car racing. What makes it slot car racing, you ask? For starters, you see the entire track at once from a top-down view. But more crucially, you don't actually steer. You simply control your speed via the shoulder trigger - your car will never spin out or fly off a tight turn - and switch from one lane to the next by tapping up or down on the D-pad. This actually creates a problem with the driving that could cripple it for some players: the controls are relative to the car's position - which is to say, pressing right moves the car one lane to its right. This makes sense, but thanks to the top-down view and winding, twisty tracks that constantly change the direction the car faces, moving one lane to the car's right doesn't mean it will actually move to the right onscreen - it will move the car right, left, up or down, depending upon which direction the car is facing at that exact moment. If that sounds confusing when you read it, that's kind of the point - imagine these directions changing several times a second as the car whizzes around the track. It takes some practice to be able to plot your little speedster's path. Gameplay itself takes the form of roughly 28-30 different mini-game challenges, only a few of which involve traditional racing. This is a double-edged sword; we sometimes wished there were simpler, straightforward race modes, but it definitely gives you the opportunity to do things you've almost certainly never done before. Description We remember slot car racing from the olden days - but never with seven players and as many as 80 cars clogging the superfreeways. This is new.